The latest Star Trek film strands Kirk and his crew on a remote planet during the first leg of the U.S.S. Enterprise's five-year mission! Captain James T. Kirk, Spock and medical officer Leonard H. "Bones" McCoy encounter new species and characters like the warrior Jaylah! They'll need all the help they can get from Sulu, Chekov, Scotty, and Uhura to face the great unknown! Little is known about Krall the assassin, but one thing is for sure: he's up to no good! 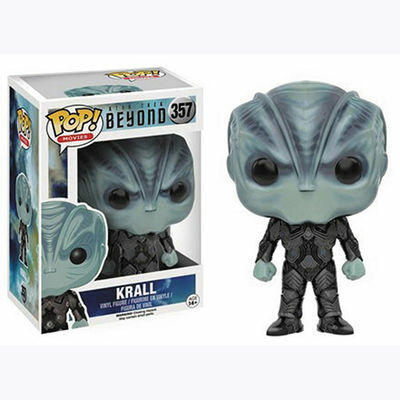 Collect all of these stylized, 3-3/4" vinyl figures from Star Trek Beyond. Legal Notice: Entire contents trademarked (® or TM) and copyrighted (©) 1986-2019 by Things From Another World, Inc. and respective copyright and trademark holders. All rights reserved. Page rendered at 2019-04-19 01:43:36 in 0.256 seconds.